This is possibly one for steve or will - any information about coleson's coppice which appears to be at the far edge of sydenham common - any info on the manor house and the folly near horniman drive? Coleson's Coppice (also called Calton's Coppice) was a 40 acre wood, previously part of Sydenham Common, bought by Thomas Calton from Henry VIII sometime after 1544. At about the same time Calton bought the Manor of Dulwich, which remained the property of the Calton family until 1605 when it was sold to Edward Alleyn. The wood was fenced, to keep livestock out, and the trees were regularly cut back to ground-level, to provide timber and encourage fresh growth. The Manor House, built about 1815, survives as 53 Honor Oak Road, with considerable extensions to either side (some, I believe, by Ted Christmas). However, it's not quite that simple, for there was also another house, called Manor Lodge, near Canonbie Road. This was replaced in the 1930s by a house, called The Manor, that was demolished, I believe, some years ago. The folly was built at the highest point of the garden of Tewkesbury Lodge in about 1880. Tewkesbury Lodge, south of Hamilton Lodge, was demolished in about 1930. The folly is listed grade II. 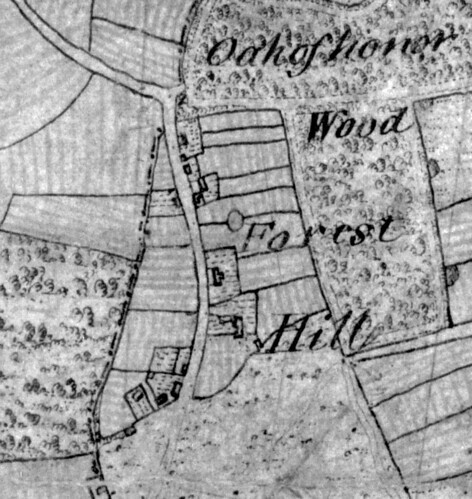 Much more information can be found in John Coulter's Sydenham and Forest Hill Past. Well steve you never cease to amaze me with your knowledge of the area. I was of the understanding that the house called "the manor" was directly behind and in the grounds of "Fairlawn House" which had some conection with "Castrol Oil"?. Somewhere around there was also an Observatory? I have just got a copy of the book you mentioned and note the baton of local history has been passed to you by john coulter and from what I've seen on this forum your miles in front - well done and thanks. i found a picture of a copper codpiece, if it's any help? peter coppin wrote: … "Fairlawn House" which had some conection with "Castrol Oil"? Fairlawn House, on the site of the school, was a research department for Burmah Oil from about 1922 until the outbreak of WW2. It was destroyed by a flying bomb during the war. peter coppin also wrote: Somewhere around there was also an Observatory? That would be a house that stood on the corner of Honor Oak Road and Honor Oak Park, opposite the Catholic school. All that survives today is the very imposing entrance gate. From 1857 to about 1879 Edwin Clark, a civil engineer and amateur astronomer of some note, lived here. Clark worked with George Stephenson and in his will Stephenson left him a legacy of £2000. Clark used this money to build a telescope at the top of his house; the house became known as Observatory House. Apparently, Clark made several important astronomical discoveries here. Incidentally, thanks for the compliment, but I have learnt, and still learn, a great deal from John. And, lambchops, finding a link between a copper codpiece and colesons coppice is amazing. I do enjoy your earthy Aussie humour. It puts me in mind of Barry Mackenzie. Well, it's in the name Coppice...I have a question about bombs in Sydenham which I will put in a new thread. Thanks Lambchop - and yes I beleive your right - it appears the name comes from cornwall - where it appears that the coppins arrived in london around the time of the battle of deptford bridge ( which I understand was possibly the last battle to be fort in london - pitty Lewisham Council have not made a thing of it. ) - however the route the took appears to have pockets of coppin`s so I must believe its true. In no way was my joke intellectual!! I noticed this was posted on boingboing.net...rather ironic i'd say. Certainly no boingboing going on in there. it's disappointing that the house with the observatory on top isn't standing anymore.